This comes a week after Arjo Atayde posted a photo with Maine Mendoza on his Facebook page. In what seems to be a rare moment, Maine Mendoza posted a photo with Kapamilya actor Arjo Atayde. On her Instagram stories, Maine Mendoza shared a photo of her with Arjo Atayde during an event of a cosmetics brand she is endorsing - a scenario far from the usual paparazzi photos fans usually see online. 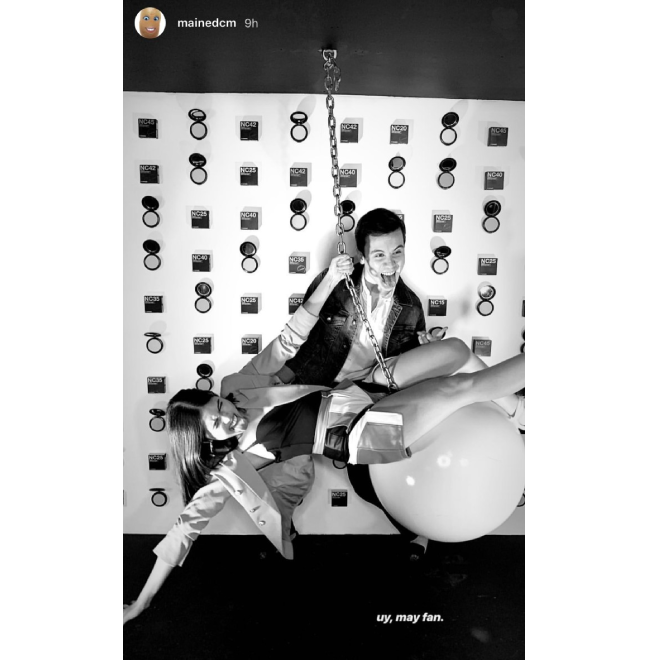 In the photo, Maine Mendoza can be seen sitting atop what appears to be a wrecking ball while Arjo Atayde stands behind her. Over a week ago, the Arjo Atayde actor posted on his Facebook a photo with Maine Mendoza while the latter was endorsing a brand in New York - a time during which the Kapamilya actor was also in the US as part of Maja Salvador’s concert. Back in January, Arjo Atayde admitted that he and Maine Mendoza are "exclusively dating."